Caption slip reads: "Photographer: Wyman. Date: 1957-03-24. Reporter: Thackrey. Assignment: Hero kids. 13/14: First shot shows Gary showing Steve how he got Roy Miller, 4, out of the hole the boy had fallen into. 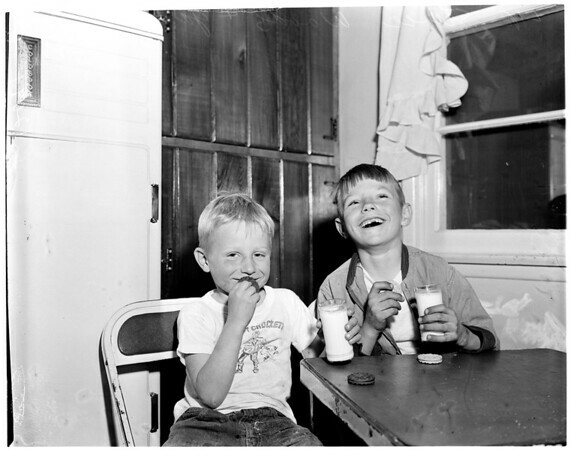 67/68: Second shot shows the cookies and milk the boys got as reward for saving the Miller child's life. Stevie ran to get help while Gary dug young Roy's head out of the dirt. L/R: Stevie Woods, 4, and Gary Woods, 8".